A family can be defined as the body of people that first allow one to experience God’s love. It is comprised of people of different ages and gifts, and nurtures all of its members through their physical and spiritual growth. Often a family has its own quirks that make being in its company comfortingly unique. While Camp Stover was often described as an “intergenerational camp,” we prefer to describe it by a more accurate title: family camp. This week gave us the rare opportunity to minister to and learn from campers of all ages, from baby to elder and everyone in between. Our wiser friends taught us what it looks like to worship wholeheartedly and be leaders of their own families and the family of God. We helped them to see the hope in the younger generations of campers. Our in-between friends showed us what thought-provoking preaching feels like (thanks Uncle Josh! ), what active listening sounds like, and what meaningful mentorship looks like. In turn, they allowed us to practice these skills for ourselves. Our youthful friends taught us what it looks like to work hard and play hard, as they ungrudgingly completed service projects and kitchen patrol by day (singing along the way, I might add) and dominated ping pong tournaments by night. In return, we shared with them lessons and testimonies of peace. And our youngest friends taught us the innocence of childhood and encouraged us to indulge in it as we joined them on the playground and enthusiastically listened to their unending stories. With diversity of age comes diversity of learning, from which we enjoyed greatly. As for our specific participation with the Camp Stover family, our tasks ranged widely. We led morning watch every day for a small but lively crowd. 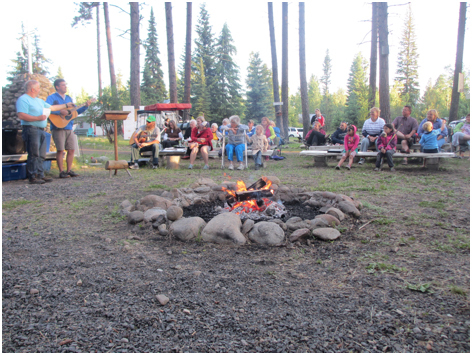 We shared each evening at large group campfire, although we preferred to step back and let the varied gifts of the community shine. 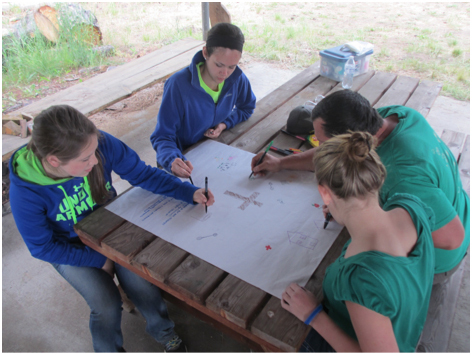 We taught a few of our sessions to junior, junior high, and youth campers, which tested our adaptability as a group. 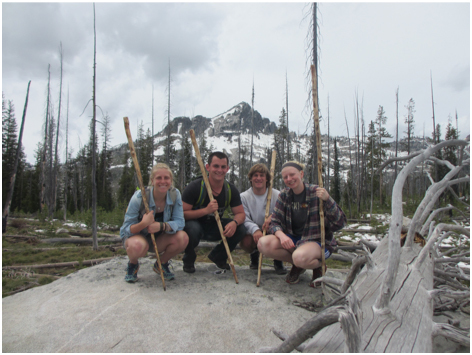 We were blessed to join the youth on a hike through mountains and granite ridges, led by “Mountain Man Dan” and putting the personalized walking sticks he crafted for us to great use. We even sang lullabies one night, where we simultaneously calmed down the rowdiest of junior boys and rejoiced in our growing musical abilities. 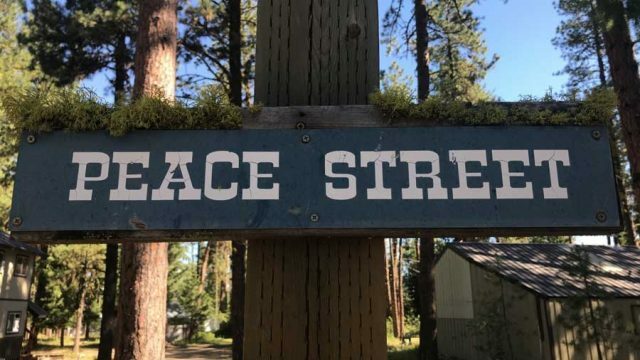 Each task was an opportunity for us to make connections, create content, and soak up the many facets of beauty that make up this Idaho camp. We are thankful for yet another week of being welcomed into a family, but especially the unique family of Camp Stover. We leave with knowledge of many new songs, relationships with friends of all ages, and grateful hearts for the encouraging adventure that was family camp at Camp Stover. At Camp Stover, we truly experienced a new dimension of the term “family camp.” Not only were families present, but we were also treated like part of the family there. We were cared for in many ways including one leader, Tanya, asking us our favorite snacks and then buying them at the store for us! Being on the road (or in the air) for weeks helps you appreciate the little expressions of hospitality that people show you. Along those lines, a virus was making its way throughout the camp and happened to infiltrate my system as well. I got extremely sick with a stomach bug and was quarantined all day with small children who also had the sickness (caution tape was even put around our cabin). What I didn’t expect was to have at least four women act as mothers, bringing me blankets, drinks, and setting up movies for me and the kids to watch while we were in bed. I felt so cared for and loved! Plus, watching Despicable Me & Grease twice with some campers in a cabin all day really creates some interesting memories. Once I was better, I can’t count how many people approached me saying they missed me in our sessions and at morning watch! It feels great to know I matter and help make a difference. While making our way down the mountain I thought I was leading a group of about 8 across the trees. It wasn’t until about 5-10 minutes without looking back that I realized that all of the group except one camper had chosen to stop playing this game. That one camper, Carrie, and I made a pact that we were going to travel down the entire rest of the mountain using only trees and rocks. It wasn’t quick, it wasn’t easy, and yes it may have been really stupid considering a storm looked like it was about to roll in. But, it’s a hike that for me will stand out against all other hikes I’ve been on. Carrie and I had the opportunity to experience the freedom of hiking with no path with the feeling of creating our own unique path. I can truly say that the closest I felt to God all week was while traversing that mountain – experiencing God’s beauty in a unique and memorable way. Family to me was expressed on the last campfire on Friday evening. Jake came up with a great idea to do a “You know you are at Camp Stover when…” skit in which we would state happenings that are inseparable from Camp Stover. As we all compiled a list of the elements that make Camp Stover, I was really appreciative of Camp Stover and all that we had come to experience (and yes my collaborative family as well, the YPTT). Jokes were tossed around from the way Keith prays to Mountain Man Dan being the MAN, from golf carts to tournaments and much more. We performed the skit all together and the crowd roared with laughter. Each member of that camp knew each other; although we did not share every experience the personalities were unique enough that all could buy into the humor. It was at this moment that I truly experienced the family of Camp Stover. They had a tight knit structure and every camper had in some way, shape or form had experienced the gifts of others. I was touched by Josh Brockway’s sermons, struck by the care of the camp as Goose Creek Murmurs were shared by Keith, and burst with excitement at learning how to play horseshoes from Scott, Anna, and Gary. And we as the Youth Peace Travel Team had somehow tapped into all that positivity and made a hilarious skit of it all. It was well received by the whole camp and we thoroughly enjoyed our time at Camp Stover. I know we will always be welcome at Camp Wilbur Stover because hospitality and a spirit of warming welcome make home there.